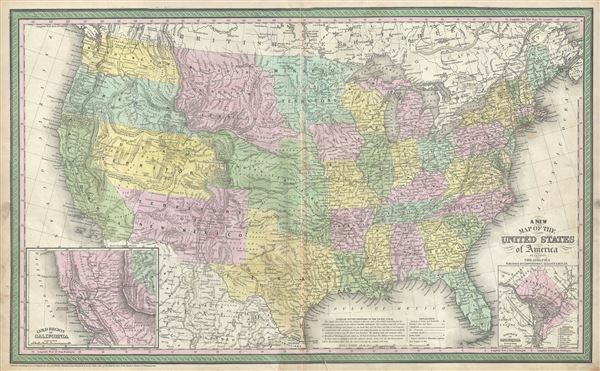 This is a fine example of S. A. Mitchell's 1854 map of the United States. Issued shortly following the California Gold rush, this map covers the United States from coast to coast, extending as far north as the Canadian border and as far south as Mexico. Political and topographical features are noted and color coded with elevation rendered by hachure. Mitchell issued this map during a period of explosive population growth and territorial expansion. As the title suggests this 'New Map' was issued in many editions and updated regularly to reflect the most up to date political developments. This focus of this map is the transcontinental routes that linked the developed east coast cities with the new State of California. Shown are the routes from Fort Smith to Dona Ana, the Fort Smith - Santa Fe Route, General Kearney's Route along the Arkansas River, the Oregon Trail (Oregon Route), Fremont's exploratory route, and the Great Spanish Trail from Santa Fe to Los Angeles. Set in the extreme corners of this map are two insets reflecting the most exciting developments of the time, the partially constructed national Capital at Washington D.C., and the California Gold region surrounding the Sacramento and San Joaquin Valleys. Political and topographical features are noted and color coded with elevation rendered by hachure. Cartographically there is much of interest, especially in the western states where territorial development was still in progress. Washington and Oregon extend eastward as far as then the Rocky Mountains. The vast Missouri Territory extends from the Rockies to the Missouri River and south to the Platte River. Utah Territory and extends from California to the Rocky Mountains and the Great Basin is recorded as 'Fremont Basin.' New Mexico extends from California to Texas and, though this map was issued in 1854, two year after the event, the Gadsden Purchase is nowhere in evidence. American Indian groups are identified throughout, as are mineral deposits, topographical features, pots of interest, and navigable river ways.